Around three miles south of Hatfield town (and two stations down the line via all-stops commuter trains) is one of Britain's leading girls' public schools – Queenswood School. 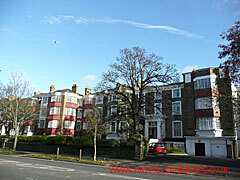 Founded on 23 September 1894, it moved from Clapham, London in the mid-Twenties. It has been associated with Hatfield – largely by choice – ever since. Today, Queenswood's closest railway station is Brookmans Park, and most people tend to think of it as being located there (Hatfield remains its postal town even though the district's name has since changed to Welwyn-Hatfield). Queenswood isn't as old as Roedean in Brighton or St Swithins (the supposed inspiration for St Trinians) in Winchester but it still has an interesting history that links together an eclectic and often distinguished mix of people and places. Queenswood School, established by Methodist ministers (Rev Dr David J Waller and Rev Marshall Hartley), was a pioneering establishment in what were largely uncharted waters with the tide of public sentiment running against them. Education for women was largely seen as a waste of time and money, as they were expected to stay at home and bring up the children (men only have themselves to blame as their unreliability and failures brought about the revolution in social thinking that swept these notions away – and eventually led to the Child Support Agency). The Queenswood name is said to be the mirror of the Methodist boy's school overlooking the City of Bath, Kingswood. Founded in 1748 by John Wesley, Kingswood School still survives but it is co-educational. In Hortis Reginae – Latin for Of Queen's Gardens*, which was the title of a lecture on education given by a famous Victorian, John Ruskin, at the Free Trade Hall in Manchester in 1864. In a Britain which has seen a woman thrice elected to the office of Prime Minister and 'Girl Power' widely (and often loudly) proclaimed, young people may find it hard to understand the long struggle women had to be allowed a full and proper education (they only received the right to vote in 1918). *Please note: demonstrating the pitfalls of the apostrophe for the unwary, one book refers to the title as Of Queen's Gardens; the other as Of Queens' Gardens. The sort of grammatical confusion that leads to Pandas – an already endangered species – to allegedly discharging loaded firearms in public eateries (If you're not familiar with Lynne Truss's Eats, Shoots & Leaves, then you are forgiven for mistaking this alleged display of wit for softening of the brain). Sometimes described as a Victorian sage or prophet, John Ruskin (1819-1900) first made his name as an art and architecture critic. Although an early supporter of the Pre-Raphaelite Brotherhood (a group of young English artists formed in 1848), he was responsible for bankrupting the painter James McNeill Whistler – who took exception to his criticism and sued him in 1878 but only won a farthing in damages (equivalent to a quarter of a penny or 0.25p). Somewhat ironically, John Ruskin's own drawings and watercolours won posthumous acclaim and he is now considered to be a talented artist in his own right. However, it was his social commentary that probably had the greatest impact – even after he died. Apart from his Manchester lecture providing Queenswood's motto, his work Unto This Last (published as a book in 1862), inspired an Indian living in South Africa, who read it in 1904, to establish his first cooperative. The man, who had previously studied law at the Inner Temple in London, went on to establish similar communities (known as Ashrams) in India. Mohandas Karamchand Gandhi, better known as Mahatma Gandhi, was assassinated in 1948. Queenswood School was based at Kings Avenue, Clapham, London from its inception in 1894 to 1924 (apart from a brief interlude during WWI when the school was evacuated to Swanick, in October 1917, to avoid Zeppelin bombing raids). It moved to Hatfield in 1925, with the official opening ceremony taking place on 15 June 1926. The vacated Clapham property was described, by estate agents Douglas Young & Co, as having 33 bed rooms and dormitories, 24 lecture and classrooms, gymnasium, laboratory, library, dining hall and a 'magnificent', 300-seat capacity, assembly hall. Initial attempts to sell it appear to have failed and the property was sub-divided into four lots 75, 77, 79 and 81 King's Avenue, Clapham Park. Today, at least some of the original buildings appear to be still standing as Queenswood Court apartments (as shown in these photos). The official histories of Queenswood record that Miss Trew, the headmistress at the time, inspected a number of properties before selecting Sheepwell House as being the best place to relocate the school. However, they don't record that the property appears to have come to market as a result of one family's sorrow. It had been owned by Lieutenant Colonel Lord Alfred Eden Browne DSO, RFA, youngest son of the Marquess of Sligo. Lord Browne, who served in India and Gibraltar, was killed on active service on 7 August 1918, aged 40. He is commemorated on the war memorial on Salisbury Close outside Oaksmere Park. His wife, Cicely, reportedly died on 10 August 1918. Although the dates indicate Lord Browne died before his wife the wording of the funeral notice suggests that she died first (possibly the news of his death had not reached the family). Sheepwell House itself was destroyed in a fire in 1936 (known as Head's House at the time). However, there is a happy ending – although Lord Browne died before his elder brother and did not inherit the marquessate – HM Queen Elizabeth II, exercising her royal prerogative in 1953, allowed his son and daughters to 'enjoy the title, rank, place, pre-eminence and precedence' that would have been their due if not for the early death of their father. Sheepwell House and its large grounds was situated between what was then the District of Potters Bar in the County of Middlesex and the District of Hatfield in the County of Hertfordshire. Miss Trew had a choice of which district and county the school would come under, and she opted for Hatfield (the property was advertised as being Sheepwell House, Potters Bar). While this choice may seem odd today it would have been simpler back then. Miss Trew, the governors, and many of the pupils' parents grew up in the Victorian age, and may have attended or at least read the coverage (as some would have been children at the time) when Queen Victoria's last Prime Minister, the 3rd Marquess of Salisbury (who served three terms, and four as Foreign Secretary), was buried with a state funeral at Hatfield. However, what probably tipped the decision was Hatfield's place in history – as the location where Queen Elizabeth received the news she had ascended the throne while reading a book in Hatfield Park. 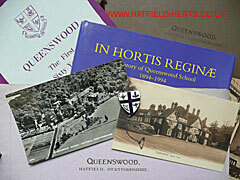 For a school called Queenswood, with its Queen's gardens motto and dedication to educating girls for positions of responsibility, Hatfield must have seemed the perfect choice. 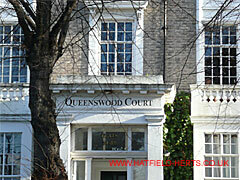 Hatfield town itself played a small part in Queenswood's history (apart from shopping trips that were allowed on certain afternoons) – the girls watched a film of the 1953 coronation of HM Queen Elizabeth II at the town's cinema. Probably the most dramatic event in Queenswood history was the fire that destroyed Head's House (the original Sheepwell House building). It started through unknown causes around 02:00. The 65 girls who were sleeping in the building were safely evacuated before the fire took hold. However, the best efforts of the volunteer Fire Brigades of Hatfield, Barnet and St Albans, who having nearly emptied the school's swimming pool turned to a nearby lake, went unrewarded and the building was gutted. Fortunately, there were no casualties – The Times reported that even the school's pet dogs, Robin and Bruce, escaped. The new buildings erected on the site of Head's House, following roughly the original shape but with extensive internal remodelling, were designed by (later Sir) Percy Thomas, President of the Royal Institute of British Architects. They were opened by Lord Macmillan, Chairman of the Court of the University of London in October 1937. The Queenswood estate was hit by 38 bombs during the war – the most notably was in October 1940 when what is claimed to be the first 1000lb bomb dropped on England blew up while the girls were at dinner. Fortunately, the only casualty appears to have been the hockey pitch. Apart from that only minor damage was caused by the bombings. According to the early published school histories, Queenswood, having sponsored two ambulances during WWI, took a decidedly nautical turn during WWII and 'adopted' no fewer than 3 naval vessels. HMS British Guiana (FY271) and HMS British Honduras (FY272) were originally civilian trawlers taken over by the Royal Navy following the start of the war in 1939. While requisitioned trawlers didn't have the glamour or recognition of the Royal Navy's big ships they played an invaluable role in WWII and were involved in many key campaigns and battles. The heroism and sacrifice of those who served on them was second to none. The third vessel, HMS Columbine (K94) was laid down as a warship – a Flower Class Corvette (Please see feature on HMS Tweed). Miss Trew's nephew served on this vessel. All three vessels survived the war. While the school escaped being requisitioned and serious damage (Miss Trew famously having repulsed an attempt to seize the school's iron gates for scrap metal), the girls could not escape a world at war. A 72-strong Girls' Training Corps was established in November 1942 (and disbanded in May 1945). Its highlight appears to have been appearing at a Hertfordshire GTC rally at Hatfield House in 1943.